Two cable rigs and a rotary drilling rig. 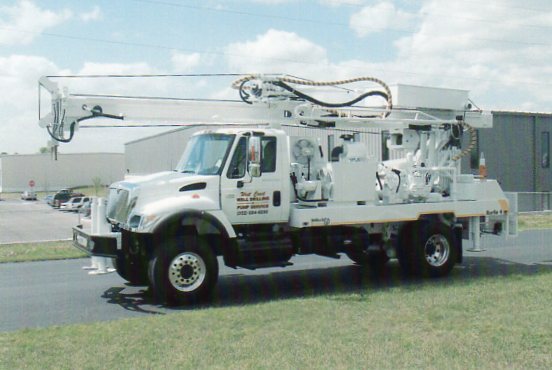 Each rig is manned by experienced and licensed well drilling contractors and experienced helpers. These contractors have worked many years for West Coast Well Drilling, in and around the surrounding counties. Experience counts and knowing the area is important because you want to know what to expect when your well is drilled. Are you going to need a water-conditioning system? How deep do the wells in that area run? We can tell you what we have experienced in the past in a certain area and what kind of water your neighbors have. This isn't always an accurate bench mark because, mother nature can and does throw us curves. Knowledge of a particular area as to water tables and underground formations is very helpful in determining what we will encounter when drilling. West Coast Well Drilling & Pump Service, Inc. has been drilling (domestic & irrigation) water wells and doing pump & well services and repairs in the tri-county area for over 20 years. We do both residential and commercial work. West Coast has earned a reputation for quality workmanship and customer satisfaction and this is why much of our business is based on word-of-mouth from previous customers. Our prices are always based on brand name, quality products. After 20 years of experience, we have gained a great deal of knowledge and expertise in water well drilling and repairs. We feel that dealing with an experienced company in this particular field is a cost-effective decision. Feel free to call for a free estimate or more information. Copyright West Coast Well Drilling, Inc 2009. All rights reserved.